Swedish Copper Iron Legged Tea Kettle? 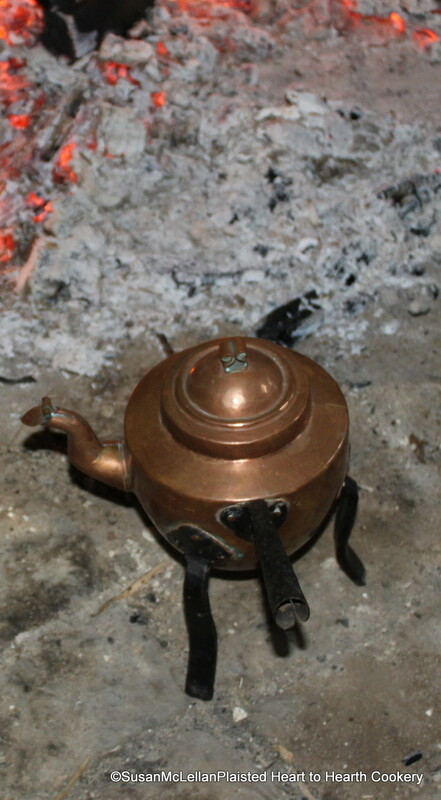 At my tea workshop, this small, tin-lined copper tea kettle with iron attached legs and copper closure over the spout, was my favorite to use to fill the tea pots. I have seen a similar kettle on display at the American Swedish Historical Museum in Philadelphia and the only picture I have discovered refers to it as a Swedish mini copper tea kettle. I would love to know more about this piece. Please comment if you have any information. Dear Susan, I would agree with you about the kettle being of Swedish manufacture. Although I don’t have any specific documentation or references that I can pass along – a previous discussion I had with former Winterthur Museum curator and base metals expert Don Fennimore about a similar example confirmed a Swedish attribution. very pretty… there are a lot of copper kettles over here, usually just on display rather than being used, but I don’t recall seeing one with a side handle. I have a larger one almost identical (could be the exact same style) to this one. It came from Sweden (it was my great-grandpa’s in Sweden). So nice to see your kettle! Thank you Allyson for sharing! I just inherited a kettle that has the same design, with a few different details: the handle is wood, the top cap’s knob is different, the legs are gold in color and may be brass. The story is that it came from Sweden with my great grandparents, before 1916. One of them was from Stockholm and the other from Varberg, I don’t know which one brought it.